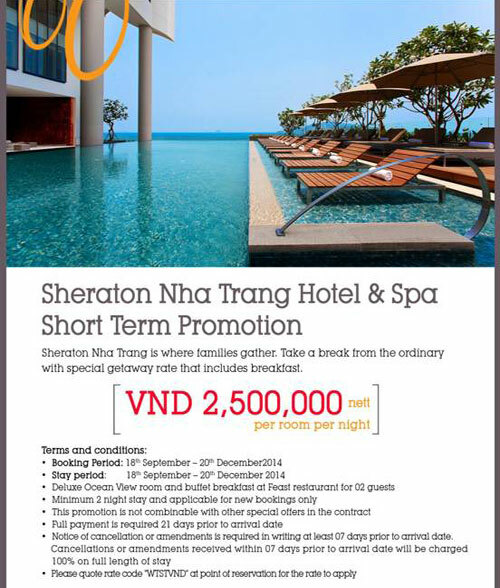 Sheraton Nha Trang Hotel & Spa offers ten categories of accommodation – from spacious, deluxe rooms to 70 squaremeter executive suites and one, distinctive 182- square-meter presidential suite. Your home away from home, the Sheraton is an ideal jumping off point for island-hopping, Scuba diving, snorkeling and a host of on-shore cultural attractions. Sheraton Nha Trang stands beside the 7-kilometer crescent of Nha Trang Beach, within walking distance of downtown’s bustling streets, picturesque markets and compelling neighborhoods. Slightly further afield is the renowned Oceanographic Institute, the holiday villas of the last Vietnamese emperor and the mineral springs at Thap Ba. The Cam Ranh Airport lies 35 kilometers south of Nha Trang via a new coastal highway. At Sheraton, we believe life is better when shared. 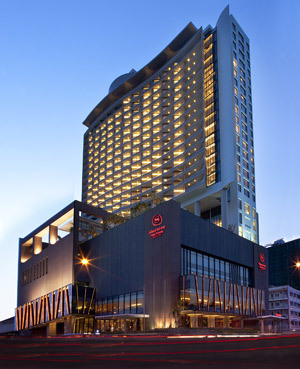 Now you can enjoy The Link@Sheraton experienced with Microsoft on level one. Feel free to surf the web on our terminals or bring your laptop for complimentary wireless broadbrand. With lobby designed so you can socialize with new friends or old, and to connect with those that matter most. Programmed by Core Performance, Sheraton’s fitness program rolls out a multitude of exercise options. Work out in the hotel’s expansive gym, following your own regimen or one of Core Performance’s themed programs. Or tone up in the privacy of your own room with a Sheraton Fitness by Core Performance Gym-In-A-Bag. Wellness and relaxation options abound at Sheraton Nha Trang. Our 21-meter lap pool with reflection area (a sun-bather’s paradise) and children’s pool offer panoramic ocean view from the sixth floor. Shine Spa’s ample menu provides a wonderfully comprehensive range of options. The Yoga Studio adds that extra-special wellness dimension for practitioners or those who’d like to get started on Yoga and Tai Chi. Deluxe Ocean Views – 141 Rooms: 37 King (DKS), 50 King Non-Smoking (DKN), 22 Twin (DTS), 32 Twin Non-Smoking (DTN) rooms at 33 sq m with picturesque ocean views. Rooms are equipped with Sheraton Sweet Sleeper twin (137cm x 203 cm) or king-size beds, balcony, lounge / sitting area, wireless and broadband data port, hospitality port, 37” flat screen LCD television with satellite channels, mini bar and safe. All rooms have a bathroom with separate bathtub and rain shower featuring unique glass window allowing a view of the living area and ocean. Premium Deluxe Ocean View – 33 Rooms: 16 King (PDS) and 17 King Non-Smoking (PDN) rooms at 41 sq m with picturesque ocean views. Rooms are equipped with Sheraton Sweet Sleeper king-size beds, balcony, lounge / sitting area, wireless and broadband data port, hospitality port, 37” flat screen LCD television with satellite channels, mini bar and safe. All rooms have a bathroom with separate bathtub and rain shower. Club Ocean Views – 38 Rooms: 10 King (CKS), 16 King Non-Smoking (CKN), 4 Twin (CTS), 8 Twin Non-Smoking (CTN) at 33 sq m with picturesque ocean views. Rooms are equipped with Sheraton Sweet Sleeper twin (137cm x 203 cm) or king-size beds, balcony, lounge / sitting area, wireless and broadband data port, hospitality port, 37” flat screen LCD television with satellite channels, mini bar and safe. All rooms have a bathroom with separate bathtub and rain shower featuring unique glass window allowing a view of the living area and ocean. Club rooms include access to the private Sheraton Club Lounge located on 25th floor with indoor and outdoor seating areas, private check-in and out, complimentary refreshments throughout the day including breakfast, afternoon tea and evening canapés. Club Premium Ocean Views – 4 Rooms: 4 King Non-Smoking (CPN) at 41 sq m with picturesque ocean views. Rooms are equipped with Sheraton Sweet Sleeper king-size beds, balcony, lounge / sitting area, wireless and broadband data port, hospitality port, 37” flat screen LCD television with satellite channels, mini bar and safe. All rooms have a bathroom with separate bathtub and rain shower. Club Premium rooms include access to the private Sheraton Club Lounge located on 25th floor with indoor and outdoor seating areas, private check-in and out, complimentary refreshments throughout the day including breakfast, afternoon tea and evening canapés. Junior Suite Ocean View – 28 Suites: 8 King (JSS), 20 King Non-Smoking (JSN) at 49 sq m with picturesque ocean views. Rooms are equipped with Sheraton Sweet Sleeper king-size beds, separate lounge / sitting area, balcony, wireless and broadband data port, hospitality port, 37” flat screen LCD television in the bedroom and 42” flat screen LCD television in the living room with satellite channels, mini bar and safe. All rooms have a bathroom with separate bathtub and rain shower and powder room. Junior Suites include access to the private Sheraton Club Lounge located on 25th floor with indoor and outdoor seating areas, private check-in and out, complimentary refreshments throughout the day including breakfast, afternoon tea and evening canapés. Executive Suite Ocean View – 29 Suites: 10 King (ESS), 19 King Non-Smoking (ESN) at 70 sq m with panoramic ocean views. Rooms are equipped with Sheraton Sweet Sleeper king-size beds, balcony, separate lounge / sitting area, Jacuzzi, wireless and broadband data port, hospitality port, 37” flat screen LCD television in the bedroom and 42” flat screen LCD television in the living room with satellite channels, mini bar and safe. All rooms have a bathroom with separate bathtub and rain shower and powder room. Executive Suites include access to the private Sheraton Club Lounge located on 25th floor with indoor and outdoor seating areas, private check-in and out, complimentary refreshments throughout the day including breakfast, afternoon tea and evening canapés. Presidential Suite – 1 Suite: King (PSS) at 182 sq m with panoramic ocean views. The room is equipped with Sheraton Sweet Sleeper king-size bed, 2 balconies, separate lounge / sitting area, dining room, pantry, sauna, Jacuzzi, bathroom with separate bathtub and rain shower, powder room, wireless and broadband data port, hospitality port, 37” flat screen LCD television in the bedroom and 42” flat screen LCD television in the living room with satellite channels, mini bar and safe. Presidential Suite include access to the private Sheraton Club Lounge located on 25th floor with indoor and outdoor seating areas, private check-in and out, complimentary refreshments throughout the day including breakfast, afternoon tea and evening canapés. Explore a diversity of culinary traditions under a single roof. Sheraton Nha Trang’s restaurants cater to diners inclined to linger over a long meal and a fine glass of wine, or those on the go for work or pleasure. A one-of-a-kind culinary concept in Nha Trang, Sheraton’s flagship restaurant celebrates foods from Italy to India, and all across Asia to Japan. Show kitchens invite an interactive dining experience, and spectacular views of the bay inspire opportunities for contemplative digestion. A la carte menus are available at lunch and dinner. Dim sum, East Asia’s favorite comfort food, is the order of the day, all day long in this vibrant first-floor venue. Amidst décor inspired by hawkers’ street food stalls, this up-market noodle shop is a great choice whether you’re after a quick bite or a great indulgence. A modern venue with glass walls and views of both the lobby and the bay, this stylish watering hole offers more than 100 vintages and serves a wide variety by the glass. Malt whiskies and an array of international cocktails round out the beverage options. Freshly baked homemade cakes, sandwiches and superb brewed coffee are the lure to this chic Italian café, where relaxation is the rule and people-watching on Tran Phu Street beyond is a pastime. An inviting evening retreat for an aperitif or a nightcap, choose from a full selection of international beers, fine wines and premium spirits, as well as exotic finger foods. This poolside bar is wonderfully appropriate as a setting for tropical drinks, snacks and munchies. Lights meals and a selection of fresh-fruit smoothies are served throughout the day.